This lecture, The Miracle of Crawling, is Tim Anderson’s reintroduction of one of our earliest movements, our original locomotion. Crawling is more than just something we did or should have done as a baby; it’s an integral part of who we are. Tim Anderson Crawling – Benefits of Crawling – How Does Crawling Help? This lecture, The Miracle of Crawling, is Tim Anderson’s reintroduction of one of our earliest movements, our original locomotion. Crawling is more than just something we did or should have done as a baby; it’s an integral part of who we are. It is the foundation. Learning how to crawl again can nourish your brain, tie your body together and remove physical barriers. “As a baby crawls, he’s growing his brain or nourishing his brain. He’s also integrating his entire body—the proprioceptive system or sense of self. When I say proprioceptive system, I simply mean that your body has proprioceptors or nerve endings all over that supply your brain with information. Tim Anderson is the co-author of Becoming Bulletproof: An Uncommon Approach to Building a Resilient Body and the author of Pressing Reset and Fitness Habits Made Easy. He’s been a personal trainer for 14 years and can be found via his Live is Movement website at tasfitness.blogspot.com. Tim did a fantastic job of explaining the importance of crawling. After listening to the lecture I immediately applied some simple baby crawling strategies to a couple of my clients with an instant improvement in their faulty movement patterns. 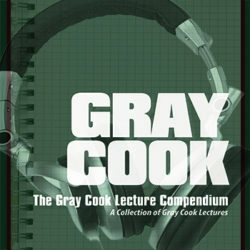 You must purchase this audio lecture.